It is through Christ that we gain our Freedom and no longer remain a candidate for the second death. In fact, we can have the same “FREEDOM” in North Korean as in the country of our birth, whether it be America or Brittan or New Zealand or Australia or Canada or …when we bow our heads and worship the one true God. What we as Christians gain is a gift, not a right. It is our liberties that enable us to worship, to work, to live our lives within the bounds of the liberties we enjoy. Because the laws of a country are set my man, they fall short of God’s expectations of how mankind should care for and “love” their fellow man within their respective societies. As such, the law of the land needs to be continually worked on, to improve its functionality. But with that said, the nature of man will continually attempt to “beat” the “law” for his own personal gain rather than work for the overall good of the society. Now our freedom, in Christ, is a spiritual attribute that sets the person free and it cannot be forcibly taken from us, but sadly, many have given it away and have become bound up by the evil generated by Satan throughout all the earth. North Korea or Iran or ??? may imprison us for what we believe and hold dear, but all they have taken away from us are our liberties but they cannot forcibly take away our deeply enmeshed Freedom in Christ. If we are in Christ, and Christ is in us, then we have gained the blessed assurance that awaits us and physical death cannot steal it from us. Sadly, when society ignores injustices, whether real or imaginary, those who feel aggrieved will rack up their message and any meaningful debate on the required resolution goes out the door and the society begins to break down. It is during times like these that the message of Christ is needed the most and neither patriotism nor politics has a part to play in delivering that hope to the people at large. The God of Abraham, Isaac and Jacob is needed more today and the people outside of the “church’s” doors are looking for someone, like you and me and . . . ., to bring God’s truth into their lives. If we are in Christ, then we are those people that can deliver that message. We are a Royal Priesthood charged with this responsibility during this present time. but he would have been the first one to say that our freedom of speech and our freedom to protest peacefully should not be taken away from our citizens by a demagogue. I like "bumfuzzled." Well spoken. Thanks. My Adopted Fathers Casket was also Draped with the American Flag and He was buried with Full Honor. My Bio Father is KIA/MIA and I am still waiting for the " Miracle " That all of them are found and brought back to American Soil. I grew up in the Military overseas and I for One understand the True Meaning of the " American Flag" and I will Continue to Respect it despite what I may feel about the Injustices in the world. I clearly understand the " Rights " that so many gave their life for, while so many Ungratefully demand those " Rights " that they are entitled too but did Not Sacrifice Or Fight For. I find it unacceptable that so Many things have been taken away in the Name of Rights. The American Flag stands ( one of many significant Meanings) for Freedom, yet when I was growing up, I had the Freedom and The Privlege of Standing Up Every Morning In School and Saying the " Pledge" while facing the American Flag. I don't have a problem with Peaceful Protest but let's be honest and call what is really happening when one takes the " Knee" or " Sit's" or refuses to come out during the National Anthem...... Disrespect for All Those Who Fought And Many Lost Their Lives to Provide those " Freedoms". You minus well be " Spitting " once again on Those Soldiers who fought. Politics and Religion I understand the Separation but when your in a Fox Hole in War, even the Staunchest Aetheist is going to say a little prayer. I love our country. Love the military and forever grateful to them. I would never want to live anywhere else but the United States. . I also love and support our police department. Without them we would have crime without end. I am grateful for them. I have never thought of the flag as something to be thought of as highly as some here. The Vietnam war was being fought all through my childhood and I imagine most who are posting here experienced the same thing. Richard Nixon was involved in Watergate and resigned during my Jr. and Sr. year. I watched as blacks were treated horribly during the Civil Rights movement and the assassinations that occurred I remember vividly as they too were during my school years. I say all this as I don't see this protest among the athletes as anything but respectful yet bringing our attention to an important issue that does involve what the United States stands for, equal liberty for all, including those of color and immigrants. If they wouldn't have protested I don't think we would be talking about it now, yet most have not brought up the reason for this protest. They are protesting the recent shootings of African Americans with no cause. They have said it is not about disrespecting the flag and I believe them. As for social justice. I can't accept "The world and its governments are not always just." I as a Christian, regardless of some thinking the two do not go together, cannot sit or stand by and think the world and government are not always just. In American, the beauty of America, is that we can protest and we can change things. For myself, the sermons mean nothing to me if we aren't also willing to fight for good and fair treatment of all human beings. Especially in America. I have no problem with these protests. Hopefully it will get us talking, which it has. Just remember why they are protesting. To the African American this is important. They fought for our country too. I don't believe that makes me a bad American or Christian but if humanly labeled as such I would be fine with that. Wade, I was born a Steeler fan. My first words were SUPER BOWL. I was also bumfuzzled when I heard what the Steelers did and the LAME excuse the coach gave for doing it. 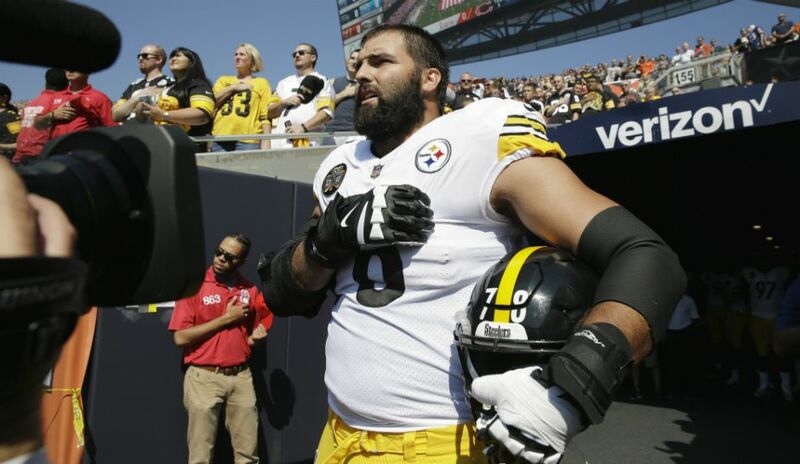 Alejandro Villanueva, know what it is to wear a different uniform, a uniform with honor, unlike the 90% of the other football players who think a football jersey bring them some sort of honor more than serving their country. Coach Tomlin said he was disappointed that Alejandro Villanueva "defected". I can understand folks not liking what's happening in politics these days. Presidents come and go. We have had some good ones and not so good ones. We deal with it as Americans. We deal with it like adults. We set the example for the younger generation like Emmanuel Christian School does. Thanks for the reminder, It is all about Jesus. It is all about loving people and telling them about Him. Everything else is 'soap bubbles". Wade, just a little additional info. Villanueva said in 2016. “But I don’t know if the most effective way is to sit down when the national anthem of the country that is providing you freedom and providing you $60 million a year is the best way to do it when there are black minorities that are dying in Iraq and Afghanistan and protecting our freedom for less than $20,000 a year.” BOOM! Thank you for your excellent comment. Of course, fight for social justice in terms of our government! Our country needs you. I'm only cautioning (through my post) that the ultimate hope for any person is Jesus Christ, not a government, and speaking as an American citizen (and I'm only giving my opinion), I am turned off by any movement that denigrates the national anthem or the flag of the United States. I believe men and women should be free to do just as they please, I am not a supporter of any movement that chooses to call attention to their cause in this manner. To me, it disrespects the men and women, of all ethnic backgrounds, who shed their blood for the freedoms Americans enjoy. "When your in a Fox Hole in War, even the Staunchest Atheist is going to say a little prayer." Pege said:"Coach Tomlin said he was disappointed that Alejandro Villanueva "defected"." 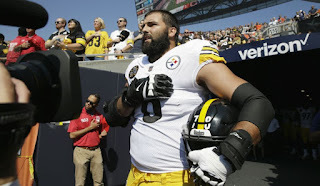 It is a strange time in America when it takes more courage for an athlete to boldly project his allegiance to his country than any "courage" displayed by those in the majority who collectively protest against the nation's flaws. As things get more and more ridiculous, it instills in me the feeling similar to that I had when living in other countries; that of my being an alien who is passing through this place while having a "home" in another place. I still love the people, and the nation, always, but not so dependent upon it as previously, and assuming more frequently the perspective of being an "outsider". "All great nations commit suicide with 7 steps" by former Colorado Governor Richard Lamm. 1. Have America use more languages than English. 3. Celebrate diversity rather than unity. Replace the 'melting por' with the 'salad bowl' metaphor. 4. Make the fastest growing group the least educated with a 50% high school dropout. 6. Be labeled a "racist" if you disagree with "Victim". 7. Make it impossible to enforce immigration laws." How many steps has America completed? I just mentioned on the previous blog post "Comments" that I think we have a problem. I believe the comment just prior to this illustrates. I have never seen "Rex Ray" post as "Anonymous". Looks to me Chrstianne that "the demagogue" you rail constantly didnt start this issue with the NFLs rich, spoiled kneeler/protestors/players. Trump didnt start this but looks like he may very well finish it along with the NFL. Just desserts if rhe entire league folds. Perhaps a "misguided" American at least. No sympathy here for NFL protestors, "African-American" or not. Let the NFL die the death initiated by its own hand. If football is indeed dangerous, left-wing politicized football is even more dangerous. Good riddance if it comes to that. OOOPS! I must correct my error. It appears Villanueva made an error in being outside the tunnel. He says it was not intentional and he threw his team under the bus. I do want to add this, We have Billionaire owners and Millionaire players so out of touch with the American public that it's laughable. They get bonds placed on ballots to get stadiums built by the working class, who also buy the overpriced Jerseys, tickets and 12$ beers. Hundreds of dollars are spent per game to sit in the stands to watch a game. This whole thing insane. Is it me or is there a collective temper tantrum still going on Since last November when Hillary Lost the election? My computer will not work all the time and I use my wife's. "What was the name of your first dog?" "What was the name of the first person you kissed and in what location? Thank you. No worries about the exposure of confidential information; all of us have your information and that of 145 million other American citizens due to Equifax Security's database leak. I'm all for peaceful protests and I agree sometimes our police and our courts get it wrong. But, I find it interesting that these athletes who are protesting are doing it on the basis of criminals. This Latest thing is about ST. Louis. The judge found the cop not guilty because the criminal that was killed put the lives of those cops and many civilians in danger. It seems to me that if you are going to protest and disrespect our country, our flag, our soldiers, and all those fans who come to watch a game then you should make sure that your protests have a worthy champion. All these "peaceful protests" that end up becoming riots all come down to championing people who were not innocents. What about all the people that the black on black crimes are hurting. Why is it that the only black lives that matter are criminal lives? That's my first question. I also can't understand how the NFL can allow them to protest the way they are. Why did Caprinic get to wear socks with pigs dressed as cops but another player can't wear pink cleats to support his mother and Brest cancer? Or the Cowboy players that wanted to wear a small sticker to commorate 5 cops who were killed. There are so many other examples of players who wanted to do goods things...Tim Tibow is another example. But they all get shut down while those who bring shame to our country are allowed to keep being foolish. I love my country but I'm tired of all the liberal approval and conservative rejection. There is one more thing... what about those kids that took the knee. I found that sad. Kids look up to these "professional" athletes. So I guess these people think it's good to teach our children to disrespect our country. Let's get them started early! Many look on this issue and say that the NFL players have "a right" to do what they’re doing. Yes, they do, but believe it or not they have no right of expectation that the NFL must allow it. This is a fact not opinion. The NFL, if it wanted to, could end this tomorrow. They have chosen not to. It is their stage, their TV time, their fields and uniforms. The players all agree to this when they sign. Please feel free to look all this up. Second. Some people who support this right of the players also seem to want to try and tell me that because it is their right that my criticism is wrong. So one has free speech, but I do not. reminds me of the picture cartoon of two people where one was standing on the American flag and his friend walks up and asks why he is doing something so disrespectful. His friend reply's that he is teaching him and all a lesson in free speech and that its important to acknowledge it. The friend leaves and comes back waiving the Stars and Bars battle flag...the man standing on the American flag says "Thats different!" No, it is not. not even a little. My problem with how this has played out is that as a believer I have been taught by God that a lie is a lie and that either we believe in truth and speak it or we are liars. Mr. Kaepernick started this whole movement on a lie. It did not help that he was encouraged by the man who was elected president, Mr. Obama, as he stood on stage and refused to say the pledge or even place his hand over his heart. That attitude and reaction was a long time coming and it has given birth to an element of disdain for our own country by many who benefit most from it. Mr. Kaepernick said that our flag and our anthem represented "oppression,” thats demonstrably untrue. Additionally making the young man in Ferguson your martyr means you have to adhere to a lie as well. After all, even the Obama DOJ could not find fault with the police officer. Same was true in Florida and in many other instances. The reality of fatherless homes since the 70's playing out in the lives of millions of black young men and we want to falsely blame another group for it. After all, if you can divert from the facts of the matter, emotionally charge the situation and combine that with bullying people in conversation then you have a recipe for never having to talk about what you are responsible for. The NFL has made what they thought was a better business decision. For, if they had put a stop to the practice they feared protests by ANTIFA and BLM. Out of abject fear of being branded racists for that action they have done nothing and it will now cost them more than they ever dreamed of. They put profit and marketing before patrons and principle. Finally, the flag and our national anthem are the only two places that every American can go and declare unity together without having to have conditions. It respects no person above another and it requires no party affiliation. It is the song of our founding, the song of our unity and the song of our liberty & freedom. The flag has no less a distinction as it is the one that flew before us in war, flew over the schools we integrated, was the symbol proudly waived even by Japanese that served in WWII with the full knowledge that a PERSON interned their families. That same flag has been the symbol of the nation as it ended slavery, liberated millions in the world and when at its worst will make amends to all it wrongs. Our enemies benefited from us as it is the flag that saw the rebuilding of every nation we have ever warred against. Most importantly it is the flag that is draped over a casket of one who gave the last full measure and is folded ceremoniously to be handed at that moment to a grieving family. To suggest to me that it is a flag of repression is an obscenity that requires my rebuke. So go ahead, enjoy your freedom to disrespect, burn the flag, mock the country...it is your freedom, just do not be surprised when I call you out for what it is you're actually doing. Sadly, there is a difference between "freedom" and free choice and liberty. When people speak of the "freedom" to worship, they are miss using the word as what they are speaking about is their choice to worship within the bounds of their liberties enshrined within the laws of the society that they live in. Freedom has boundary conditions, such that, if they are ignored and crossed, the freedom that a person enjoys is lost. The boundary conditions have been put in place to help us to remain within our "freedom." I define freedom as a consequence of my righteous relationship with God. In other words, it is a spiritual gift from God that defines who we are. Sadly, today, the "freedom" desired by many people, is the utter rejection of God and the depravity that results. Why is this so? Because people do not understand the processes needed to establish our liberties and the people who are also responsible. Who is responsible for my/your personal Governance? Who is responsible for maintaining law and order around me/you? It will not be until people come to realise that the only person who is responsible for the choices that I make is me, and in your case, you, that things will begin to change as we accept the responsibilities for our actions and the environment that we have created, in which we live. It is only when the finger pointing stops, and the recognition of what our personal responsibilities are within the circumstances that we find ourselves in, that change can begin to happen. If this does not happen then the blame game will continue. The NFL refused to allow players to wear decals on their helmets supporting the police who were murdered at the BLM protest in Dallas. And the NFL rule book has been making the rounds online. It says as part of their job is to be on the field at attention for the Anthem. The NFL seems to be inconsistent and selective when it comes to free speech. I think they can do what they want. And I am all for a free market response. (Wink). Not more folks are questioning the 7 billion taxpayers have shelved out for the building and upkeep of the stadiums. Many middle-class families cannot even afford a ticket while the NFL got rich. Now this. Great points. Inconsistency is usually the hall mark of partisanship. Nothing wrong with disagreement over issues - as you know - but when we refuse to rally around the flag, it's hard to dialogue.